For commemorating life's special moments, nothing compares to the classic gift of Champagne. 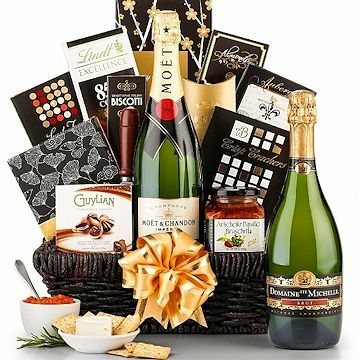 Your choice of a fine Champagne paired deliciously with name-brand gourmet foods makes for an ideal gift to send your best. Includes Busetto Dry Salami, Elki Artichoke Bruschetta, Rosemary Garlic Crackers, Brie Cheese, Almond Biscotti, and more in a distinguished keepsake basket for an impressive gift presentation. A beautiful keepsake coffee colored seagrass tray. Arrives decorated with a satin ribbon. Measures 18" x 13" x 6". Moet & Chandon Imperial Champagne: This luxurious, world-famous Champagne boasts soft and mature aromas of white fruits such as peaches and pears with hints of nuts. From a smooth, juicy mid-palate to a clean and crisp finish, the champagne releases heavenly fruit flavors with hints of fresh walnuts. Domaine Ste. Michelle Cuvee Brut : Crafted from premium grape varieties grown in Washington state's acclaimed Columbia Valley, this famous sparkling wine is made 100% in the Methode Champenoise. Bright acidity and effervescence cleanses the palate while the delicate flavors compliment a wide array of dishes.